Not only is my family bonded together by marriage and genetics, but we are also bonded together by freakishly similar looks, the same exact mannerisms, and of course, fair superior DNA! This weekend I had the pleasure of visiting with people who not only look and talk like me, but ones that share my love of crafting, organizing, eating, and dominating life. Abby and I drove to Pennsylvania to visit my Grandparents and my Aunt and Uncle for the weekend. I truly appreciated my change of scenery for the weekend. I traded my 7th floor apartment for a “log cabin” style house. I traded city side walks for trees. I traded bars and restaurants for home-cooked meals. Lastly, I traded going out to bars with Matt’s friends to look for “beautiful babies” for conversations with my 92-year-old, World War II veteran grandfather (who is a frequent commenter to my blog! ), a grandmother who rivals Martha Stewart in both her crafting supplies and skills, and my Aunt and Uncle who, on one hand raise chickens and on the other, are two of the smartest people I know (and that is saying a lot). While I love my life and friends, sometimes it is nice to shake things up; and what better way to do this, than hang out with your own relatives. When Abby and I arrive in Pennsylvania on Friday we were welcomed with hugs and a delicious spaghetti casserole. Sitting around their little table in the kitchen, I was instantly brought back to my own childhood, where family dinners were a nightly occurence. The food was great and the company even better! I have looked at wedding dresses a few times with my parents and my sister, but I still haven’t found “the one.” I thought it might be fun to look with my relatives and was shocked to find a bridal salon in their small town that looked like it had a great selection. At first my grandfather wasn’t going to come but he wasn’t too hard to convince! We took over a section of the store and Abby and I walked up and down the racks of dresses pulling plastic bags, that I hoped might contain the perfect dress. I tried on countless gowns, many of which looked good, a few of which looked great; however, I liked the dress best, that immediately got “boos” and disgusted faces as I walked out of the dressing room. My family has never been one to hide their true feelings! In the end, I found two dresses to add to my list of possibilities, but no dress that made me think, “this is it!” After watching hours of “Say Yes to the Dress” I might have unrealistic expectations for the whole process. I am starting to think that not everyone has that feeling, especially those of us who over think every decision! After our adventure, we came home and I helped my Grandma organize some of her crafts. She has a craft “loft” that I could probably spend months in. 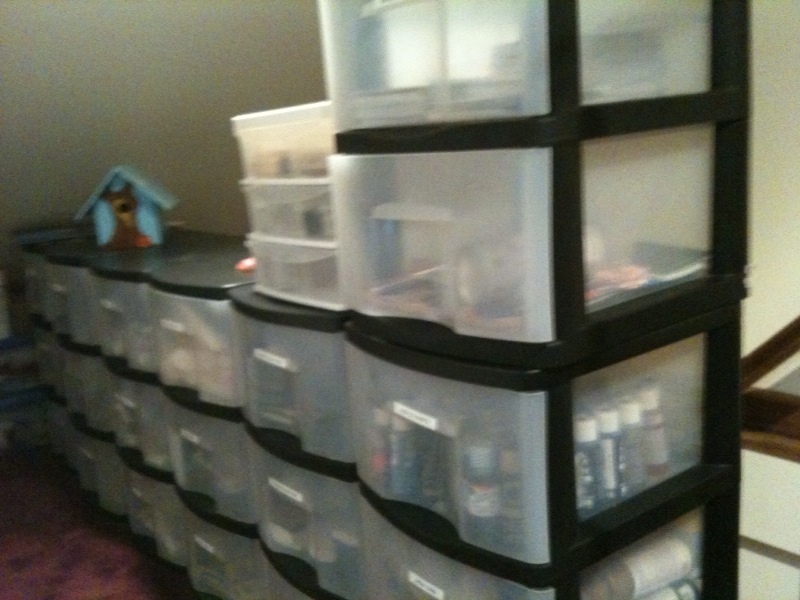 Plastic drawers lining the walls, organized with various stamps, glitter, glue and paints. Unfortunately, when she looks for things she has to open and close numerous drawers because she can’t always find what she is looking for. After reading one of my previous posts she asked me to bring my label maker to solve this problem. I felt as if she gave me my organizational “fix” for the weekend! That evening, after another delicious dinner, my Grandma has a special project for Abby and me. When my grandparents lived in Florida, we would visit them every year over April vacation. When we were there we would do a craft project, taking advantage of her talents and craft supplies. Over the years we made gym bags, scrunchies, greeting cards and much more. We sewed, stamped and colored until we had a wonderful creation to bring back to NH with us; and this trip was no different. My Grandmother is an excellent painter and creates wonderful decorations for her home. Sprinkled all around her house are numerous gourds that she painted to resemble snowmen and birdhouses, and ones that were decoupaged with different pictures of flowers and butterflies. She set us up with gourds, paints and a book full of ideas. 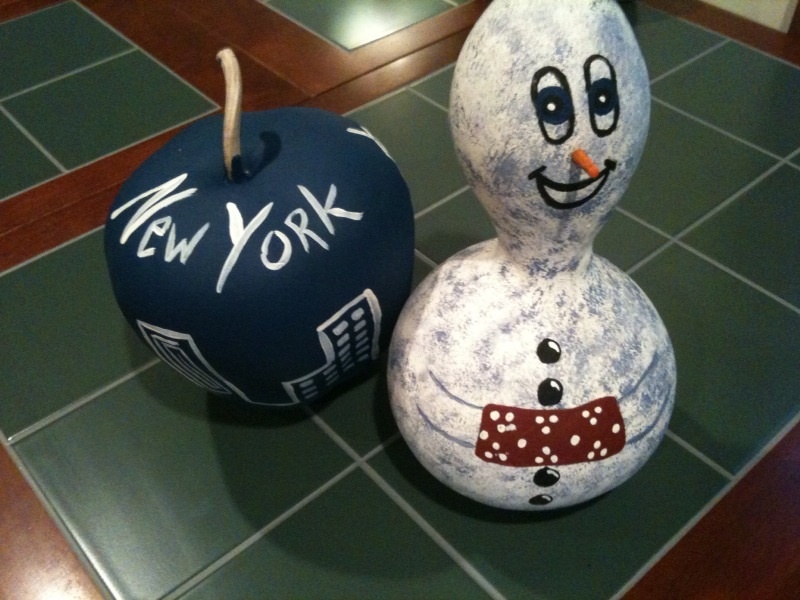 I modeled my gourd after one of the snowmen that my grandmother had sitting above the stairs. 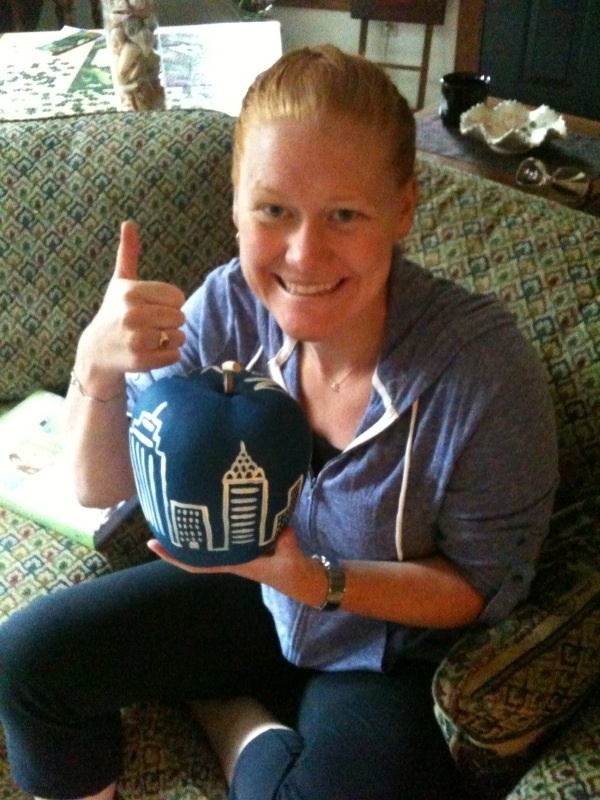 Abby was a bit more creative with her craft and painted her gourd with the New York city skyline. The weekend culminated this morning with waffles and bacon. My uncle ground the wheat himself before my Aunt made the waffles. To say that were delicious would be selling them short. And clearly, my family had REAL maple syrup from New Hampshire – a perfect ending to a great weekend! No wonder you are so good at crafts. Please take me to your Grandma’s house next time so I can make a gourd!! what a wonderful blog – it almost made me cry:) i am so happy that you and abby had such a great visit!! Awfully lonesome here. Thanks for the wonderful blog after a tiring and long drive home. No more rain but it is cooling down considerably this eve. Dumb me! I tried to respond to your Retraction and naturally it didn’t go. Finally after exercise class I figured it out. Try again. I noticed the error but felt with numbers like that what is the difference. Thanks for all the nice compliments, we do all complement each other nicely! E, says thanks too!